our iPhone or iPad as a timer. There are numerous apps to perform this basic task, and after working with several I selected LabTimer for review. My main reasons for this choice were price (free), device support (iPhone, iPod Touch and iPad) and the availability of a large number of simultaneous timers. While the app has not been revised for some years, it still seems to work just fine. I first reviewed it on my blog in 2011, and have periodically used it personally ever since that time. One of the features that I like about this particular timer is that you can have up to 16 simultaneous timers in place (on the iPad version, 4 on smaller screen devices). As shown in the screenshot, you can display four of the timers at a time, but all of them can be active and timing. I am sure there are science applications (as well as things in sports or around the house) where this flexibility is useful. By the way, you can enter names for each timer (the ones shown are just the default). To enter a timer name label just touch that field, and enter the text. The use of the stopwatch is easy and intuitive. You press the large button which switches from a green Start to a red Stop to perform timing (can turn them on and off at will). A small icon over the timer number indicates it is paused (yellow) or timing (green triangle). When you want to reset the counter to zero you simply press the Clear button. The display is in hours:minutes:seconds. The response of the screen input limits timer apps from reliably measuring times in fractions of a second. 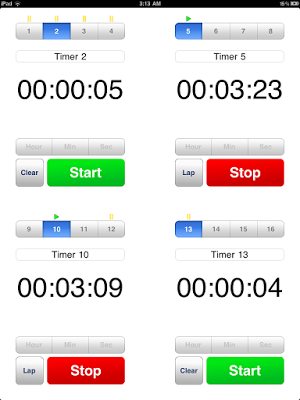 If you do need tenths of a second, you can try the inexpensive ($0.99) iLab Timer HD. It has lap features, useful for athletic timing. The LabTimer app will run on iPod Touch, iPhone and iPad. I have tried it on both an iPod Touch and on a couple of iPad models (iPad 2 and iPad 4). I have not tried it on the newest iPad models, but I have used it with the newest version of iOS (as of July 2017). It works flawlessly on all the platforms I tried it on. On small screen devices you get four timers only, otherwise functionality is the same. One nice feature is that timing will continue in the background even as you have put the app away and are working in another app. The timer also can function as a down timer. To do this you first reset the timer, and then press the Hour, Minute and Second buttons multiple times to set them. If running in foreground an alarm goes off when it is over. One nice feature of the countdown timer is that it shows you the time (according to the clock on your device) when the timing cycle ends. The LabTimer app is solid and intuitive, and the price (free) is certainly attractive. It would have been nice to squeeze out tenths of a second, and some have complained about lack of landscape mode (and I concur that is an issue). At one point the developer had a pay version of the app called LabTimerPhD as a way for users to donate to development of the app, but that no longer seems to be on the App Store, at least not here in Canada. Making reference to the criteria we use for our reviews, not all of which apply very much to a timer, I found that the app offered excellent value, was intuitive, had excellent functionality, and was free of negative distractions. Of course it can&apos;t claim to be novel or unique, as the app store is full of basic timers. I give the app an overall rating of 8 (out of 10) which is in the excellent category, and recommend it to anyone needing a timer. There are other timers that have a more elegant screen appearance, but for basic operation this remains my personal favourite. 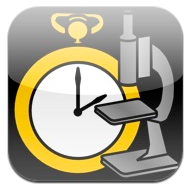 Do you have a favourite scientific timer app? Do you disagree with something in this review? If so, why not leave a brief description in the comment section. This review was last edited by R. Hawkes July 16, 2017.